The gray colonial house at 142 Oldfield Road is located in Fairfield Center, an easy walk to the train station, shopping, restaurants, recreational venues, and many other town amenities. 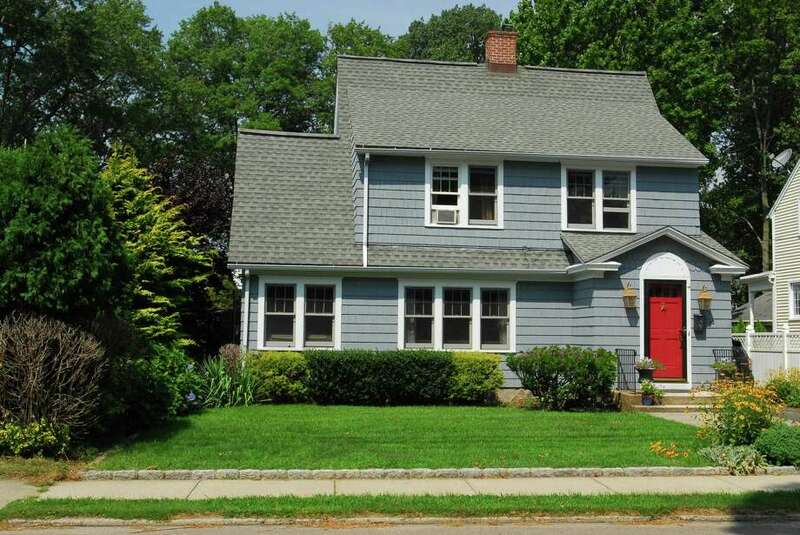 FAIRFIELD — The gray colonial house with white trim and a red door at 142 Oldfield Road is located in Fairfield Center, where houses are close together and neighbors really get to know each other. The residents of this house can take advantage of that proximity and can also enjoy a bit of privacy, despite the diminutive property and closeness to the town center. The backyard of this level property of a little more than a tenth of an acre is completely private. It is enclosed by a tall natural wood fence. It has a good-sized wrap-around wood deck, part of which is covered. Additionally, this property is buffered by the configuration of the curved Crescent Road behind it, which arches from Reef Road to Oldfield Road. The next-door neighbor on the Reef Road side is the American Legion. One of the beauties of this neighborhood is its sidewalks — safe for dog-walking, hopscotch and chalk-drawing. One of its pleasures is its proximity to town amenities. This house is within a short walking distance of municipal bus lines, the train station, shopping, and restaurants. It is only three blocks from Sherman Green, the site of free summer concerts and other special events. Just a block away is Sargent Murphy Memorial Playground in one direction and Oldfield Park in the other. It is also a short walk, bike ride or drive from public beaches, recreational venues and open spaces including Sullivan and Kiwanis ballfields, the Fairfield tennis courts, the Carl Dickman and Pine Creek Par 3 golf courses, Pine Creek Avenue Playground and the Fairfield Fishing Academy. Also close by is the 220-acre Pine Creek Meadows, Welch Terrace Marsh Open Space, Oldfield Marsh Open Space and Old Dam Road Marsh Open Space, all dedicated to wildlife conservation. The driveway and front lawn are lined in Belgium block, and there is shrubbery along the front of the house, and perennials planted here and there. A wide paving stone path leads from the sidewalk to the front door. Inside, the formal living room has a fireplace and a door to the sunroom. From the living room pass through a wide, arched entryway into the formal dining room, where French doors open to the deck and yard. In the renovated eat-in kitchen there are Carrera marble countertops, white ceramic subway tile backsplash, hardwood floor, double stainless sinks and stainless appliances including a four-burner Five Star gas range. Off the kitchen is the mudroom with a full bath and a door to the deck and yard. On the second floor there are three bedrooms, including the master. One of the bedrooms has a staircase to the finished walk-up attic, which could be used as the fourth bedroom. The master bedroom has a walk-in closet. Halfway down the staircase to the basement there is a door to the driveway. In the basement there is a finished room, which has flexible use, and plenty of storage. There will be an open house on Sunday (Oct. 7) from 1 to 4 p.m.
For information or to set up an appointment to see the house, contact Mary Kate Klemish-Boehm of Halstead at 203-583-1027 or MBoehm@Halstead.com.